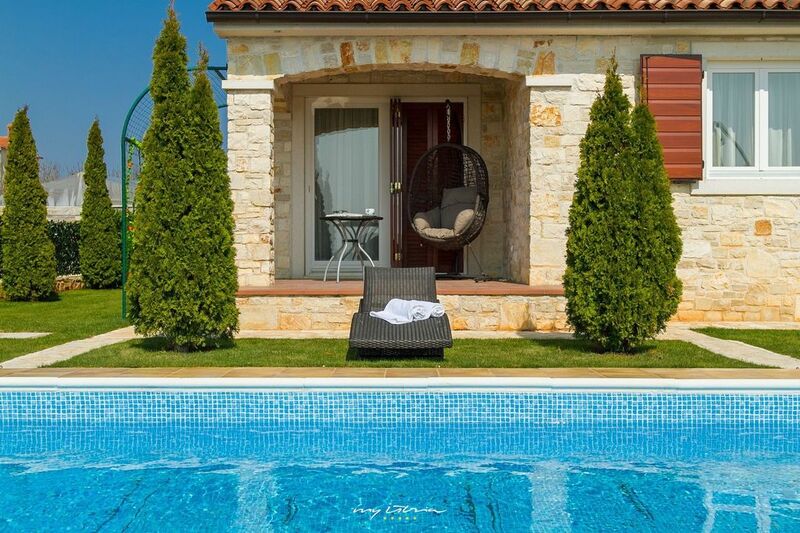 Are you searching for a beautiful villa with the pool and sea view? If so, this beautiful villa Girasole is a perfect choice! Villa Girasole can accommodate 8 guests. At your disposal are 4 bedrooms, bathroom, living room and fully equipped kitchen with dining area. Outside area includes garden with swimming pool where you can relax and enjoy the sun. You will also enjoy a stone built barbecue and al-fresco dining area. Villa Girasole is air conditioned, has WiFi, private parking for 2 cars and provides everything for an enjoyable holiday. For more fun darts and table football are at disposal. If you are a bigger party, take a closer look of Villa Vera situated next to. Eine sehr schöne Villa, die keine Wünsche offen lässt. Wir haben wunderschöne 14 Tage Urlaub genossen. Der Kontakt mit Mr. Petra war auch zuvor kommend. Alles in allem, Top! my wife and I have just returned from villa girasolle,and we cant praise it highly enough,literally as the pictures shown ,everything you could want and all laid out perfect.very quiet area but 2 vey good restaurants within walking distance and a little shop and bar ,very peacefull.host peta was available at any time and was very helpful,porec is only a short drive away,and we also went to venice for the day,would highly recommend for a relaxing holiday,but enough to do if you wanted,we would love to go back, a beautiful country. We had a lovely stay at Villa Girasole, and we would like to thank our host Mr Sinčić for his hospitality. The house is exactly as described on the website, and the view from the garden is spectacular. Kaštelir is a small, authentic village, with at least two excellent restaurants within walking distance. It's easy to reach the closest beach by car, only 10 minutes drive. Poreč is only 15 minutes away. This was our first visit to Croatia, but for sure not the last. We can highly recommend Villa Girasole and My Istria! The villa is located in a charming village called Kaštelir. It is close to Poreč and its beaches. Poreč is the largest tourist hot spot in Istria where you can find all kind of activities. If you are looking for activity, remarkable experiences and rich cultural heritage, Poreč with its 100 years of experience in hospitality and supreme tourist offer, is the place for you. Be sure not to miss the numerous parties organized in tourist villages and the town's centre. There are beach clubs, coffee bars, and after midnight you can enjoy the pleasant atmosphere of night bars and discos. Nothing but fun from sunset till sunrise! Car is recommended. Shops and restaurants are in short walking distance from the villa. Areas of interest include the Medieval Hill top towns of Motovun and Grožnjan as well as the seaside towns of Rovinj and Vrsar.